Over the past months, we have been working on the further development and testing of two of our products: Air-Craftglass transparent glass and Air-Craftglass mirrors. 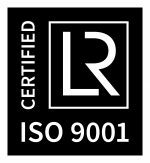 We have now successfully finished this stage, and are taking steps to obtain ISO9001:2008 and AS9100 certification. All spec and quality aspects have been combined in an attractive brochure, which is available in print and digital format. Existing and potential clients can pick up a copy during the AIX exhibition. Specifically designed for engineering departments, the brochure provides all technical specifications of our unique product portfolio.